As well as the Sevylor brand products which are good for taller people, we have stocks of the Shell - 18 pocket - Sevylor double width lilo, extra large 78inch) - Maldives fish observation window airmat - striped chair - super comfort air mattress pool toys and Boa Buddy swimming aids from this range. What people say about buying airmats and air mattresses from this page - Please also leave your feedback here about buying from us! Postage - bulk is better! Single lightweight items are around �4, single heavier quality items are around �6 whilst �12 covers a whole box full! Recent orders have included numbers of inflatable shells, whales and cheaper inflatable toys for children's pool party fun and postage was around �12. Orders up to the number in stock can be supplied by return of post. Wholesale orders or for numbers beyond those in stock are available within 10 days. 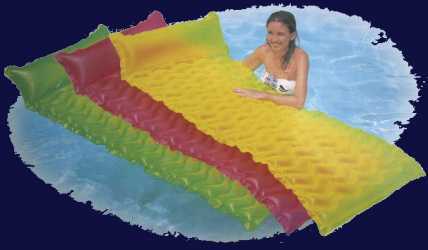 NB: If we do not have enough airbed pool toys listed in stock for your wholesale requirements, please let us know. We get deliveries from one importer every Thursday and from another within a week of our order. 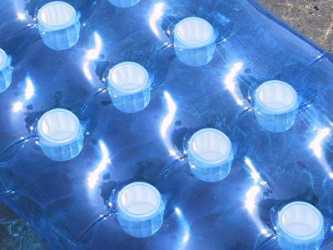 We supply airbeds, air mattresses, beach and pool toys by post in England Scotland and Wales, even Ireland wholesale and retail - but you may be viewing this page from other countries . . . Even if you are not ordering from us on this occasion, please can you email to let us know which inflatables or airmats pictured below you like and this will help us to stock up for out of season orders . . . Thanks! Please scroll down this page to see different designs. You might have come across giant airmattresses made by Gre if you have been to Mallorca. 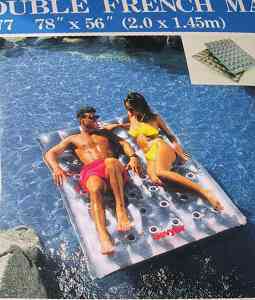 These extremely comfortable airmats are now made in China and available in the UK and are the closest available product to the size and comfort of the lilos of the 1960s. This particular type is a printed transparent glossy design, not recommended for sleeping on for camping, but wonderful on the beach or on the water. If you are going somewhere where the water could be cold, this type is large enough to enable you not to get too wet. In hot weather it's likely to expand a little and become even more comfortable. 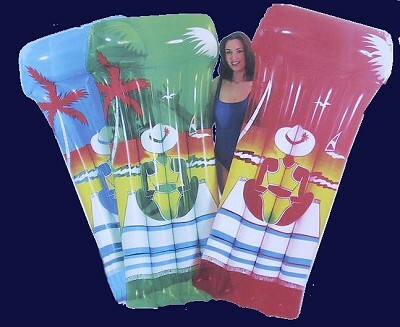 If you are a photographer doing a swimwear fashion shoot, these are ideal to set the scene in the background. We were delighted to receive a sample shot taken using a couple of these by blackblue photographic and we were pleased to have helped to have made the shot. NEW TYPES: we have stock of the old type in red, green and blue. The new stock is in Red and Blue without handles, Orange and Blue with handles for hanging on to whilst surf riding. 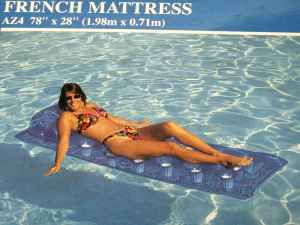 We have also especially imported a limited quantity from France of a type with plain non-glossy, non-transparent PVC which are superb for sleeping on. The old design is no longer available but we have just three remaining of these fantastic replacements. Email the webmaster if you want to buy one. �22 + postage �5. Discount if you want 5 or more. We have just acquired a small stock of transparent air mattresses that you can see through, originally made to special order for a Swedish photographer film maker to take photos through. Very unusual and extremely hard to find. �30 each + postage. Hi thank you again for getting the Air Beds to me in time. Hope you got the cheque OK. Attached are a couple of pics of them experiencing deserted Island in the Maldives this Christmas and New Year. They were good, a lot of puff to get them up but the Maldivian lads enjoyed the 2 dollars to do it. Mine weathered the corals on occasion even with my bulk; others used the cut-outs as drinks can holders when we were not looking (Carlsberg fitted perfectly). Un-fortunately our excess baggage was too much on the way home yesterday and so we had to leave our beloved beds at Male airport so you will be hearing from me before Easter when we return to the Indian Ocean. 24 IN STOCK for sale with a slightly different pillow design that is actually better . . .
For holiday use FOR HIRE, 6 available at �7.50 each per week. These have been used before and are guaranteed in good condition. They are extremely well made and are almost indestructable, and will not fail you in ordinary use. Ordering wE ALSO HAVE STOCK OF THE SEVYLOR Azur transparent blue. Blue type on left - 1 in stock. Blue type in centre - 4 in France - Sevylor type to right, stock expected soon. The new funky style has a bottle holder like a Champagne bucket on one side and a glass holder on the other. Glossy top, textured silver or coloured underside. Great fun in the pool, on the beach, or on the sea - but be careful and make sure you paddle in the same direction. The webmaster and his wife tend to go around in circles on the sea. These airmats are wonderful fun for children - between 4 and 6 children can fit on one! But if you use these at sea, take particular care. 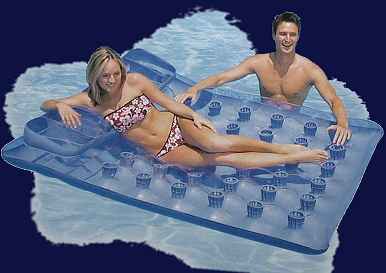 Ok for camping too - put the glossy side down - and for honeymoon couples double lilos or twin airbeds are the next best thing to a water bed. We have not found UK importers for them so they have to be brought back especially from France - and are therefore more expensive than I would like them to be. Email the webmaster if you want to buy one. �47 + �7 postage for 1 or �11 for 2 or 3. Current stock: Blue - 1 in UK and 4 in France -=- Funky - 4 in stock, 1 pearlescent white colour (PHOTO BELOW) -=- 0 SEVYLOR double airmattress in stock in UK. We also have a blue and a white for hire for filming, �20 per shoot. Bright colours ideal for corporate promotions, party sleepovers. This 4 tube design is much liked by children as the 4 tubes inflate to be slightly narrower than the 5 tube design. 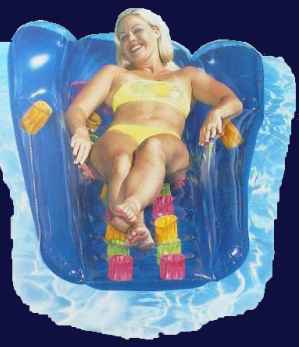 But as the tubes are larger you sink into it more for greater comfort. Likely to expand in heat. Excellent for beach, pool and sea but not for sleeping on other than for a few hours after a party or waiting for an early morning plane at an airport. Available in inexpensive quantities of 5 or in wholesale boxes to special order. Some people enjoy killing lilos and bursting inflatables and if you or your children get a buzz out of this then these cheap ones are ideal. We do not sell individual ones as you might as well try to pop 5 whilst you're at it. 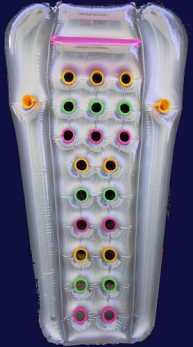 However the webmaster has tried abusing one of these inflatables by overinflation, bending and twisting and it won't pop! Instead of popping they expand and get wonderfully bigger and don't seem to want to burst. Short of using a sharp object, they seem very difficult to destroy. Reckon they'll withstand children jumping on them and twisting them in pools and on the sea but customers say the tougher ones are better. 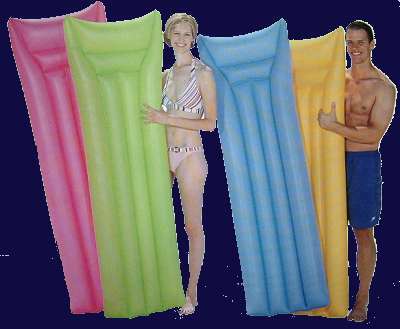 Unlike any other inflatables on this page, we guarantee that we do not expect these to last a fortnight's holiday. Just 500 grammes to put in your luggage - whilst this is advertised elsewhere as an advantage, it is a reflection of their near-disposable quality. You can have 5 of these airmatresses for the same price as others on this page which you wouldn't want to kill. (We guarantee that all the other airbeds here are very difficult to burst anyway!) Perhaps this might start a craze for competitions to pop them - would be most hilarious (and surprisingly difficult!) and people who like extreme liloing have fun with them. We can also get this type in glossy transparent Red Green and Blue but they cost around �325 for 150 to special order. 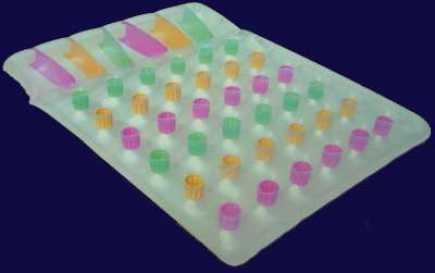 ANOTHER SORT Less cheap, but good value glossy surface, not recommended for sleeping on but very flashy for the beach or pool, for stock for pool supplies and beach toys businesses - available in pearlescent or transparent - very fashionable. These are made by Sevylor and the higher quality results in better durability. WE NOW HAVE THE LAST REMAINING STOCK OF THESE SEVYLOR AIRBEDS IN THE UK. 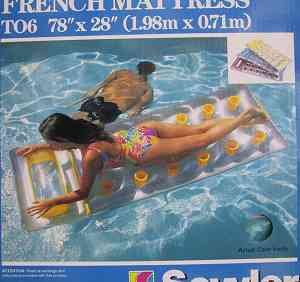 A purchaser this summer has ordered another two as presents: "the air mattress survived 2 weeks of battering by 2 large adults and still looks great" . 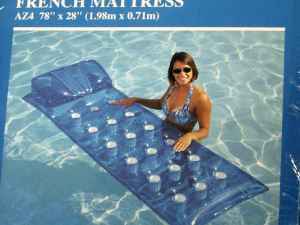 . .
"French mattresses" - luxury 18 pocket suntanner, glossy transparent top, reflective grey underneath, high quality, tough (people who have bought these tell us that they outlast other types), wider than Aqua Fun 5 tube design, very comfortable for pool, seaside sunbathing and beach use, not bad for sleeping on too. Wider than standard and recommended for comfort. Honeymoon couples report durability and enhancement to their holiday experiences. They withstand having two people on top of them (although not perhaps heavyweight wrestlers!). They may be more able to withstand rough children than others. Uninflated 74"x28" these inflate to around 25" wide. For extra tall people, see the 78" Sevylor type below. Our current stock of 18 hole (18 trous - 18 pocket) air mattresses are a good design because the pillow is a separately inflatable chamber. When sleeping on this sort of airbed, use the reflective grey side up, and they are particularly comfortable because the joint between the pillow and the main part of the airbed allows a comfortable depression for shoulders and arms. For those who are looking for a fabric covered airbed like the cotton or canvas lilos of their youth, this is the closest we have been able to find. Based upon PVC these are probably stronger than the original rubber types but if you're looking for a rubber one, sorry we can't find any. Good for sleeping on as a campbed for camping, these come in blue and pink. 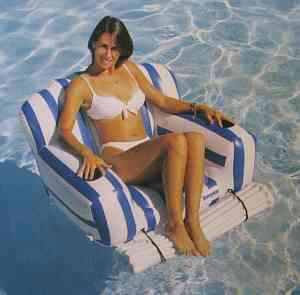 the foot section folds out from underneath to enable this chair to double as a pool toy lounger. In use it is excellent. It is such good quality that it weighs 3.5kg. 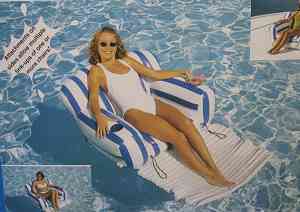 Very popular at the beach (but don't take it swimming) to sit on as a chair or around the pool or to lie on on the water. Email the webmaster if you want to buy one. �28 + postage �8. Discount if you want 5 or more. 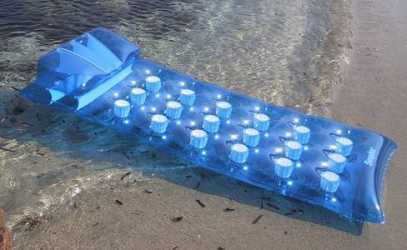 A transparent relaxing chair which can be used on land or float on the water. The type in stock has a multicoloured interior rather than all blue as shown. If you have a hoover that blows, these can be inflated in seconds as they have a bung similar to those on flock air-mattresses. One customer bought two dozen of these for a film showing in a swimming pool. Ideal in quantity for cool conferences! PLEASE SCROLL TO THE BOTTOM OF THIS FILE FOR ALTERNATIVE CONVERTABLE AIRMAT/CHAIRS AND CHAIRS made by SEVYLOR imported into the UK. These are a massive 81"x54" and with buoyancy tanks on each side, they are luxurious and near impossible to fall off or to sink. The pockets are actually holes right through so that cooling water comes through and cools you down on a hot day like the Sevylor Miami Soak 'n Float, but bigger so we prefer it. 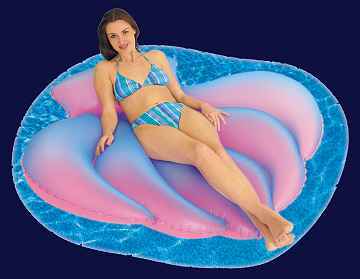 The webmaster bought something like this in Ischia 10 years ago and it was the most gloriously comfortable thing in the water. Rather like the Banana Boat that was available a few years ago. Almost unsinkable. But don't take it in the sea - it's impossible to navigate. So comfortable that the webmaster fell asleep on one on a sunny afternoon in the sea and, if the wind and currents had been in the other direction, would have ended up miles out. Excellent for the pool and the beach. A customer who bought one has ordered two more . 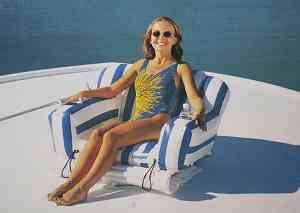 . . Do you still have the Titanic lounger available ? 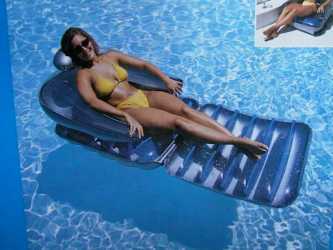 - it's quite the best pool lounger ever. YES - we have quite a lot in stock! NOW TWO DIFFERENT TYPES: holes or tubes. 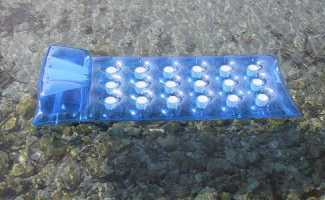 The ones with holes are like the 18 pocket type but open at the bottom for cool water and come in SILVER or BLUE. The tube type is like the Ischia variety has 3 tubes and comes in PURPLE or ORANGE with a course satin texture on one side and white smooth PVC on the other side. These are brilliant for sleeping on and better if you don't want water cooling. One cannot roll off either type! Email the webmaster if you want to buy one. �18 + postage �5. Discount if you want 5 or more. 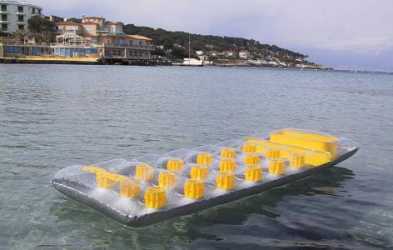 This extraordinary air mat is around 2 inches thick and can be rolled up and taken to the beach. But if you don't like the mattresses of hard hotel beds you can put one of these underneath the sheets for soft supportive comfort. We have just 10 of these especially imported from France. They will often last 6 months or more of continuous use for sleeping on every night. It's also worth looking at the super comfortable Sevylor type below. Email the webmaster if you want to buy one. �18 + postage �5. The whales are big - 80" long - and we supply Greenpeace for use in their campaigns against whaling. The other inflatable animals are around 72" - 6ft. Email the webmaster if you want to buy one. �12 + postage �5. Discount if you want 5 or more. For truly patriotic stock these cannot be beaten! Smooth but not glossy surface recommended for sleeping on as well as for the beach. Wholesale Please enquire for wholesale orders from 6 to 1000. These Union Jack airmats are white on the back so provide an excellent opportunity for UK corporate promotion with logo printing on the back. Please enquire on price. These airmats have another use! The white back makes an excellent and cheap blow-up blowup self supporting photographic reflector. This can be extremely useful and the webmaster used a number of these to take all the photos for this Polish Pottery website to surround each item with good light. Click here to visit the French beach where the French airmat was photographed. Sevylor is the Rolls Royce designer label of inflatables and air mattresses. The products listed above are all of excellent quality (or else we would not sell them) - but Sevylor is the name for excellence . . . and they are a massive 78 inches high - ideal for tall people. 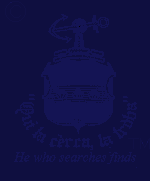 A totally transparent blue design is available - see below. Email the webmaster if you want to buy one. �22 + postage �5. It supports the body all along the way . . .
Boa Buddies are brilliantly versatile swimming aids. Fun as straight poles, the tail goes through a hole in the head and so forms a ring that can be used in different configurations. Email the webmaster if you want to order. �6.50 each or �36 for 6 + postage �3 or �5. By popular demand . . . a UK supplier in England of . 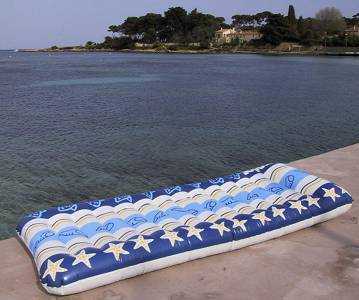 . .
Airmattresses give people a lot of pleasure relaxing in the sun and having fun in the sea . . . This airmatress is no exception but it has an added bonus . . . It's any man's dream, and has been singularly effective for ameliorating the high winter suicide rate in northern climes. The webmaster has a friend who has recently lost his wife . . . and he'll be receiving one shortly. Were he to take one to the beach, do you think that it would help him to find a wife more easily . . . or would eligible ladies run a mile? Please Email the webmaster with your opinion. Give this to any man and he'll be your friend for life! You could give it to him just to see him blush . . . or it could ensure that he'll never run off with another woman, making sure that the competition is not real . . . Excellent for keeping a relationship together . . . Or the best device for family planning . . . featuring an undressed young lady that knocks top-shelf magazine images into a cocked hat . . . This one has a single pocket in an unmentionable place that will keep your partner firmly affixed, tanning only his back. THIS AIR BED IS GUARANTEED TO WALK OFF IF LEFT UNATTENDED. :-) SO UNLESS YOU HAVE ANOTHER FAMILY MEMBER ON THE BEACH WHO IS WILLING TO BE SEEN WITH IT, YOU CANNOT GO OFF AND HAVE A GOOD SWIM. CUSTOMERS WITH PRIVATE POOLS REPORT CONSIDERABLE SATISFACTION. Wise wives buy these for their adored husbands. NOTE: as supplied, the pink hole shown in the photograph below is covered and printed as part of the image. It is a special seal which is opened by reasonable pressure with a finger. 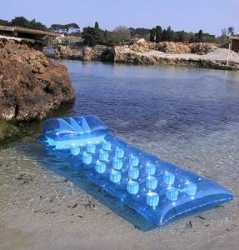 This means that this airmattress can be more overtly carried around than appears at first sight from the photo below, but don't take it to the Lido.. The main airmattress is a pink/purple tinted clear transparent with the figure printed in solid colour. WE NOW HAVE STOCK! These will go like hot-cakes - order yours now for that extra special birthday or Christmas present . . . or to cause a stir for that office party or bound to be a hit for stag nights. Email the webmaster if you want to order one. �28 + postage �5. We hope that these inflatables will give you years of service! We only stock items of good quality which we can personally recommend. When inflating, there is a non return valve which has to be opened by squeezing at the base of the tube either with fingers or teeth. Sometimes if you see which side it is fixed, you can feel through the plastic from the other side and keep the flap of plastic open with your fingers / fingernail. Lick around the stopper before putting it in: a layer of moisture helps airtight insertion and assists the seal. To ensure long life, when folding up your lylo, if you can fold on parallel lines at full width |||||| rather than at right angles ++. If the weather is hot, this may be irrelevant but at least one manufacturer recommends taking care (particularly when unfolding on sharp corners) below 16 degrees centigrade. CLICK HERE FOR INTERESTING USES FOR INFLATABLES!